Eastern Dedicated Freight Corridor is a 1,839km freight line between Ludhiana and Kolkata. Image courtesy of the World Bank Group. The Eastern DFC project includes three different sections. Image courtesy of Dedicated Freight Corridor Corporation of India Limited (DFCCIL). Works are underway on the EDFC-1 section and are expected to be fully completed by 2019. Image courtesy of Dedicated Freight Corridor Corporation of India Limited (DFCCIL). The Eastern Dedicated Freight Corridor (EDFC) project is part of India’s Dedicated Freight Corridor (DFC) programme, which aims to create one of the world’s biggest cargo operations. The EDFC project involves the construction of a 1,839km-long freight line extending from Ludhiana in the Indian state of Punjab to Kolkata, the capital city of West Bengal. 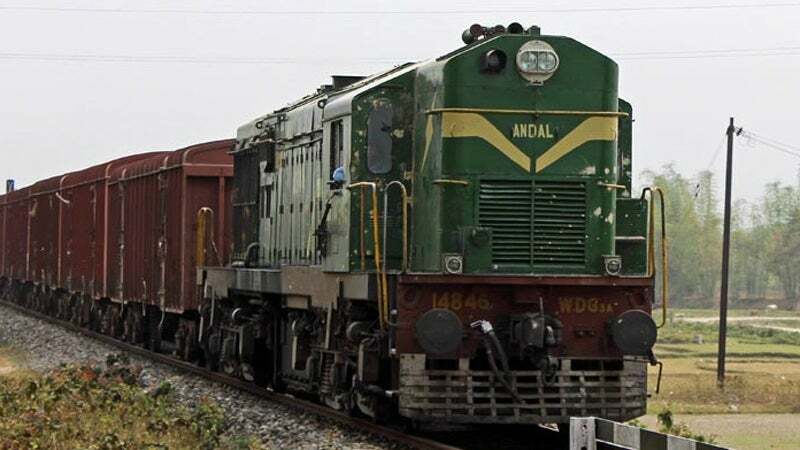 The main objective of the project is to meet the growing demand for freight on the Eastern Corridor, which starts from Dankuni in West Bengal, and passes through the states of Jharkhand, Bihar, Uttar Pradesh (UP) and Haryana before finally ending at Ludhiana. The project will ease congestion in the existing railway system, reduce travel time for passenger trains, and create additional rail transport and freight capacities. Work on EDFC-1 commenced in March 2013, while the entire project is scheduled for completion in December 2019. The Eastern dedicated freight corridor will improve passenger services in the lower Ganges basin, which is one of the most densely populated areas in India and home to many under-privileged citizens, who use rail transport as an affordable means of travel in the country. The Indian Government plans to set up seven integrated manufacturing clusters along the corridor with an investment of approximately $1bn. It will lead to an economic boost in the relatively poor state of UP and provide the citizens with better access to employment opportunities, health, education and other social services. The Eastern corridor is backed up by World Bank, which aims to achieve integration, transformation and inclusion through the project by improving transport connectivity and domestic market integration for freight consigning industries in India. Parties that will benefit from the project include power and heavy manufacturing industries, which rely on railways for transporting commodities to markets and ports, as well as community groups, residents and farmers along the corridor. The line will comprise a 1,409km electrified double-track line between Dankuni in West Bengal and Khurja in UP, as well as a 447km single-track line stopping at Ludhiana, Khurja, Dadri and Haryana. The project will be delivered in three sections with potentially overlapping construction schedules. The three sections include EDFC-1, a 343km double-track line between Khurja and Kanpur. EDFC-2 will be a 393km-long double-track line between Kanpur and Mughal Sarai. The last section, EDFC-3, will be a single-track line between Ludhiana, Khurja and Dadri that will stretch over a length of 397km. The corridor will bypass densely populated towns, including Mughalsarai, Allahabad, Kanpur, Etawah, Ferozabad, Tundla, Barhan, Hathras, Aligarh, Hapur, Meerut, Saharanpur, Ambala, Rajpura, Sirhind, Doraha and Sanehwal. EDFC-2 line will have an increased axle-load of 25t on the track infrastructure and 32.5t for supporting structures, as opposed to the current carriage tracks of 22.5t, which is equivalent to the standards in America, Russia and China. The line will be constructed as a double-line ballasted track laid on concrete sleepers and will be electrified with two 25kV AC, as well as 50Hz power generated from an overhead catenary system. It will be capable of operating trains moving at 100km/hr, and feature automatic block signalling, modern telecommunication, train radio and supervisory control and data acquisition (SCADA) control systems. EDFC-3 will involve construction of a 404km-long electrified single-track between Khurja, Meerut, Saharanpur, Ambala and Sahnewal, and approximately 46km of electrified double-line connecting Khurja and Dadri. The estimated investment for both the Eastern and Western DFCs is approximately $12bn, with $10.86bn used for construction costs and the remainder for land procurement. While the first section of the project requires an investment of $1.4bn, the second requires $1.65bn and the third requires $1.39bn. Funding will be acquired through a combination of debt from bilateral / multilateral agencies, equity from Ministry of Railways, and public private partnership agreements. The World Bank has agreed to finance approximately 1,100km of the total length of the EDFC in three phases. Accordingly, it released the first loan of $975m in October 2011 for the Khurja-Kanpur section. A second loan of $1.1bn was released in December 2014 for the Kanpur-Mughalsarai section, while a third loan of $650m was sanctioned in June 2015. The Indian Ministry of Railways is providing equity funding of $544m for the section from Mughalsarai to Sonnagar. The project has been divided into a number of sub-contracts, which were awarded to local and international contractors. A consortium comprising Larsen &Toubro (L&T) and Instalaciones Inabensa secured a contract for the electrification works on a 417km stretch between Mughalsarai to New Bhaupur in Upper Pradesh. The project will involve the construction of seven traction substations (TSS), 18 switching stations (SWS), and 881km of overhead equipment (OHE) track, as well as supervisory control and data acquisition (SCADA), electrical and mechanical works and the supply of all associated equipment. The contract to supply electrification, signalling and a telecommunications system was awarded to Alstom in December 2015. Valued at approximately $216.93m, the contract will provide the required systems for the Khurja-Kanpur section. It also includes construction of stations and a control centre. The $814m civil contract for the construction of the Kanpur-Mughalsarai section (402km) was awarded to a joint venture of GMR Infrastructure and SEWS Infrastructure (GIL-SIL) in March 2015. It involves the design and construction of civil structure and track work involving embankments, bridges, track, stations, maintenance depots and other buildings on the line. "The project will ease congestion in the existing railway system, reduce travel time for passenger trains, and create additional rail transport and freight capacities." The $488.72m contract for the Khurja-Kanpur section (343km) was awarded to Tata Projects and Aldesa in March 2013. The project is being implemented by Dedicated Freight Corridor Corporation of India Limited (DFCCIL), a special purpose vehicle established by the Ministry of Indian Railways for the construction, operation and maintenance of the dedicated freight corridors. DFCCIL is also responsible for planning, development, mobilisation of financial resources and operation of the DFCs. One of the main benefits of the EDFC project is the significant reduction of greenhouse gas (GHG) emissions. The corridor is expected to generate 10.48Mt of green house emissions up to 2041-2042 compared to a predicted 23.29Mt of GHG in its absence, and will therefore contribute to a 55% reduction of emissions. Tata Projects (TPL) is one of the fastest growing infrastructure companies in India. The company has expertise in executing large and complex industrial infrastructure projects.